SPOKANE, Wash.--(BUSINESS WIRE)--Ecova, a leading energy and sustainability management company, announced today that together with client Arby’s Restaurant Group, Inc., Powerhouse Dynamics and Weathermatic, they have received an Environmental Leader Project of the Year Award for their collective success in reducing water consumption at select Arby’s restaurants. The program began with an audit by Ecova of five Arby’s sites to identify water- and cost-saving opportunities. Through this effort, Ecova learned that irrigation generates an average of 40 percent of Arby’s total water consumption—leading to a new focus on irrigation controls. Additionally, Arby’s discussions with restaurant management emphasized the importance of offering a single online platform for visibility to monitor and manage sites. Arby’s piloted an innovative approach across 85 sites, integrating the Weathermatic irrigation control system into its existing SiteSage® asset and energy management system. Weathermatic is a connected system that offers an online platform to monitor and manage irrigation systems. SiteSage is an asset and energy management platform developed by Powerhouse Dynamics that Arby’s had already implemented across its more than 1,000 company-owned sites. The ultimate goal was to integrate the Weathermatic system into the SiteSage platform for one view into energy and water data - to simplify managing both. This solution yielded fast, measurable results. Arby’s reduced its water consumption across the pilot sites by 7,400,000 gallons over the course of a year. This is enough water to fill over 11 Olympic-sized pools. Those sites saw a 40-70 percent reduction in irrigation, leading to an average 25 percent reduction in water consumption per site. Cost savings were also significant, with each site saving an average of $1,150 annually in water and sewer charges. In addition to the award, the project was also featured in Arby’s first Corporate Social Responsibility (CSR) Report released earlier this week. To read more about Arby’s CSR efforts and to download the full report, visit arbys.com/purposefull. Ecova makes businesses and utilities more successful through energy and sustainability management. Ecova blends data and technology, with people and insight, to drive powerful results for their clients. Using insights based on consumption, cost and carbon footprint data spanning thousands of utilities, and hundreds of thousands of business sites across the United States, Canada and Europe, Ecova provides fully managed, technology-optimized solutions for saving resources, which in turn increase returns, lower risks and enhance reputations. Ecova is a wholly-owned subsidiary of ENGIE, a global actor in the energy transition. For more information, visit the company’s website www.ecova.com, on LinkedIn, or follow Ecova on Twitter at @EcovaInc. Arby’s, founded in 1964, is the first nationally franchised sandwich restaurant brand, with more than 3,300 restaurants worldwide. The Arby’s brand purpose is “Inspiring Smiles Through Delicious Experiences®.” Arby’s® restaurants feature Fast Crafted® service, a unique blend of quick-serve speed and value combined with the quality and made-for-you care of fast casual. Arby’s Restaurant Group, Inc. is the parent company of the franchisor of the Arby’s brand and is headquartered in Atlanta, Ga. Visit Arbys.com for more information. Powerhouse Dynamics uses cloud-based controls and analytics to deliver enterprise-wide energy and operational efficiencies to portfolios with small commercial facilities, including restaurants, convenience stores, retailers, and others. The Powerhouse Dynamics SiteSage platform reduces energy, maintenance, and repair expenses by centralizing control, analysis, and management of energy-consuming equipment. Engineered specifically for smaller facilities, SiteSage features powerful functionality delivered via simple online and mobile interfaces. The system continuously enhances efficiencies by controlling major loads, monitoring power consumption and the performance of individual pieces of equipment, and tracking gas and water usage. Patented analytics deliver actionable intelligence via diagnostics and alerts. SiteSage’s enterprise-wide benchmarking capabilities identify underperforming facilities and assets. To learn more about how Powerhouse Dynamics’ customers maximize energy and equipment maintenance savings and enhance food safety with minimal staff effort, visit powerhousedynamics.com, or Twitter, LinkedIn, YouTube or Facebook. Weathermatic is a leading provider of water-conserving technology and services. Our products have been installed in more than 85 countries and on high profile properties like the U.S. Capitol Building and Buckingham Palace. Using proven irrigation science and market leading technology, our solutions help maximize landscape beauty while saving billions of gallons of water. Weathermatic also provides water-saving Sustainability Services for commercial properties that can save 20-70% in landscape water through smart irrigation technology implementation, monitoring, inspections and reporting. 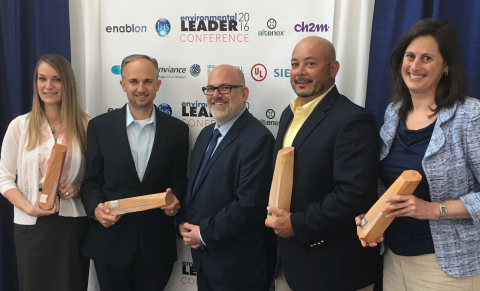 Ecova, together with client Arby’s Restaurant Group, Inc., Powerhouse Dynamics and Weathermatic, received an Environmental Leader Project of the Year Award for success in reducing water consumption.